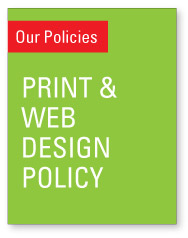 Below is an outline of our standard terms and conditions for web and print design. Please take time to read through thoroughly and ensure you understand these terms and conditions before you commence any project with Greengraphics. Greengraphics will usually require a 30% upfront payment for any design work at commencement of the project. Please note this is not a refundable deposit. Also note further charges may apply if you cancel the project before completion. If the project is deemed by Greengraphics to be greater than specified in its quote, Greengraphics may notify the Client outlining additional charges. Additional charges are usually calculated at an hourly rate of $70+gst per hour. Greengraphics is not responsible for investigating copyright or trademark matters for the Client. The Client must ensure that all material used (for their print material and for their website) is legally usable. Greengraphics is not responsible for copying and pasting text. The Client must check all text before approving designs for printing. Greengraphics’ liability to the Client for loss of any kind resulting from services provided shall be limited to Greengraphics’ fee paid by client without interest. Greengraphics will not be liable for damages of any kind including its own negligence, excluding gross negligence. The Client will indemnify and hold harmless Greengraphics against any and all claims and expenses, including reasonable legal fees, arising from the use of Greengraphics’ work. The Client should carefully proofread any design material provided by Greengraphics before it is printed or uploaded to its website. While Greengraphics takes all care to avoid errors, Greengraphics accepts no responsibility for typographical errors, spelling mistakes, or incorrect information on any project. No refunds or reprints are given after a final approved design has gone to print due to oversights by the Client’s proof reading. With all printing and website there may be some colour variations from what you have seen on screen, to what the final product looks like, and previous orders. This is due to the nature of CMYK printing, screen settings and printing system. There will be no reprints at our expense. The Client agrees to allow Greengraphics to place a small credit on printed material exhibition displays, advertisements and/or a link to Greengraphics’ own website on the Client’s website. The Client also agrees to allow Greengraphics to place websites and other designs, along with a link to the client’s site on Greengraphics own website and other websites Greengraphics deems useful for promotional purposes. Once web design is complete, Greengraphics will provide the customer with the opportunity to review the resulting work. Greengraphics will make one set of minor changes at no extra cost within 14 days of the start of the review period. Minor changes include small textual changes and small adjustments to placement of items on the page. It does not include changes to images, colour schemes or any navigation features. Any minor changes can be notified to Greengraphics by e-mail. Greengraphics will consider that the Client has accepted the original draft, if no notification of changes is received in writing from the Client, within 14 days from Greengraphics sending a ‘completion’ notice via email. It is agreed that the Client indemnify and hold Greengraphics harmless from and against all claims for injury or death to persons or damage to property (including cost of litigation and legal fees) caused by, arising from or incidental to the services to be performed during the performance of the work outlined. When Greengraphics is asked to provide printing services, we reserve the right to choose the best printer for the project, taking the preferences of the Client into account. Greengraphics will make every effort to coordinate printing and deliveries to meet client’s deadlines; however, Greengraphics cannot be held responsible for printing or delivery delays. If Greengraphics prepares electronic files or artwork for the Client’s printer, all aspects of the printing become the sole responsibility of the Client. Greengraphics encourages the Client to provide unformatted text of their work in Word format in order to avoid the time and errors involved in retyping the text. Additional expenses may need to be added to Greengraphics charges, including out-of-pocket expenses, courier services, shipping, postage and handling and travel costs, If these services are needed, they will be billed by Greengraphics. Quotes for these items are estimates only. All and any amendments to the terms and conditions outlined in this submission must be provided in writing by the Client and signed by an authorised representative of Greengraphics prior to the commencement of work outlined.